While the television and the virtual reality headset represent different eras but play the same role as technological mediators. This intallation playfully explores the relationship between participants in virtual reality and the outside world. This is achieved by permitting spectators to mischievously participate in the experience of a person inside a virtual environment. These interventions into the virtual world by the audience have the potential to be mysterious, frustrating or even disorientating. The television audience take on the role of voyeurs. They have to opportunity not only to see through another person’s eyes and but to intervene at will—all from the comfort of their sofa. SquareEyes is a virtual reality installation that playfully explores the relationship between participants in virtual reality experiences and the outside world. This is achieved by permitting spectators to actively and mischievously participate in the experience of a person inside a virtual environment. The installation consists of a simple virtual reality game run on a HTC Vive. Players are placed into a themed environment where they can use the controllers to shoot moving targets. A little way away from the play area, a sofa is set up opposite a CRT television. The environment is decorated with props that evoke a conventional family living room. The player’s perspective from inside the game is shown on the TV screen. 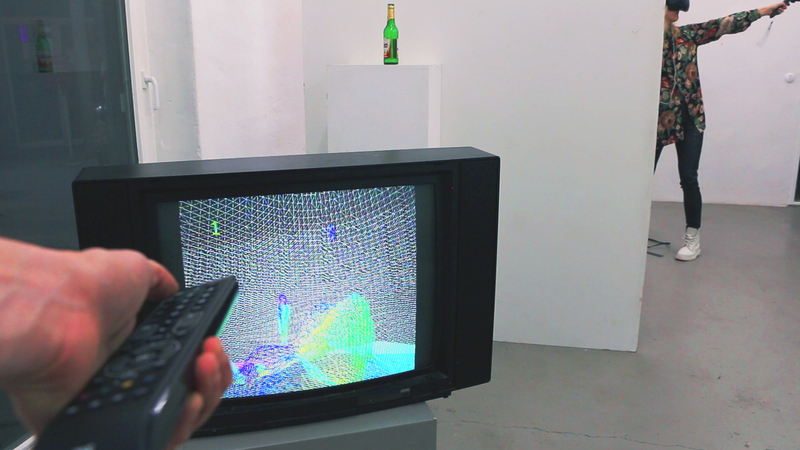 Viewers can use a TV remote to alter the player’s experience and hence, their own viewing choice. Channel buttons on the remote correspond to different environments, allowing them to choose according to their tastes (e.g. Western, Sci-fi etc…). They will also be able to adjust the volume, speed, and even pause the game. These interventions into the virtual world by the audience have the potential to be mysterious, frustrating or even disorientating. The audience take on the role of voyeurs. They have to opportunity not only to see through another person’s eyes and but to intervene at will—all from the comfort of their sofa. 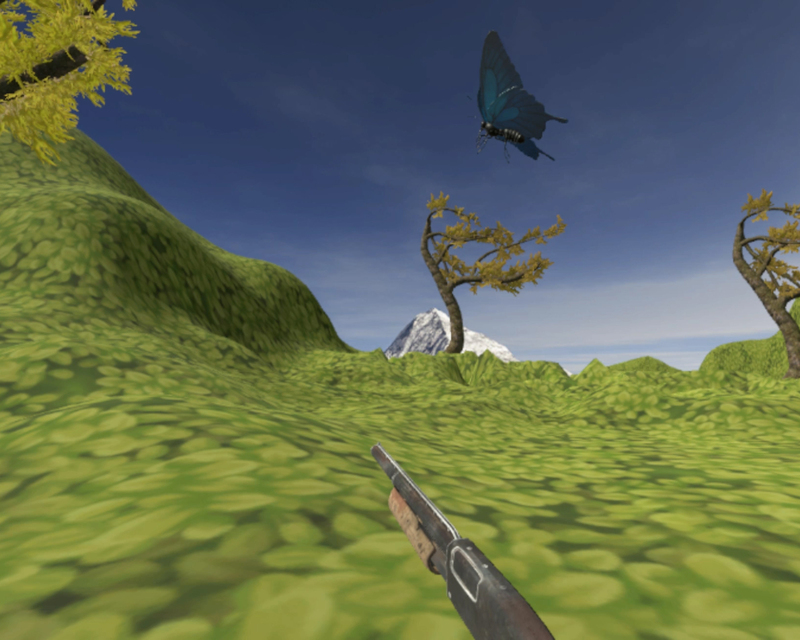 The game is build in Unity3D and run from a VR capable laptop. The game window is encoded as a video stream and transmitted over a local network to a Raspberry Pi. The Raspberry Pi then outputs this stream to the analogue television. It is also linked to an IR sensor capable of picking up signals from a TV remote. Button presses from the remote are decoded on the Raspberry Pi and relayed to the laptop, where they are interpreted by the game.